Userlike partnered with StartitUp to offer all startups a unique possibility to use 12 months of Userlike’s Team Plan (https://www.userlike.com/en/pricing), worth $444, for free. Use the promo code st4rtup759 at the upgrade page. 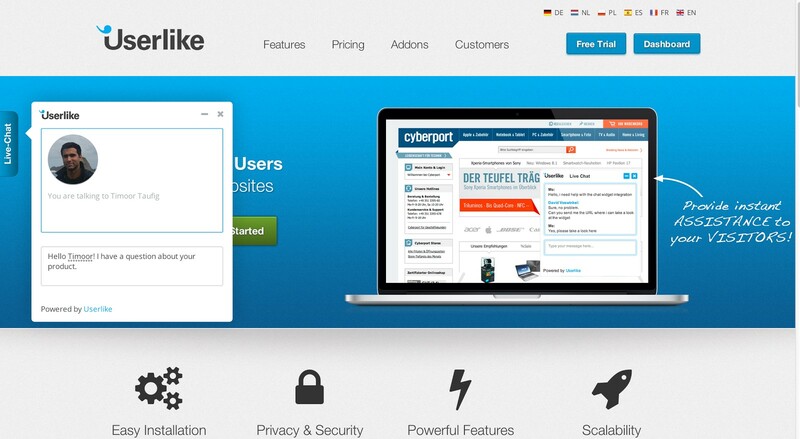 Userlike is live chat software that allows you to interact with your website visitors in real-time and on-site. Engage your customers, collect feedback, raise conversion and improve customer satisfaction all through one single channel. You can be up and running in 3 minutes. Integrate the code, add your operators, start chatting with your website visitors. No software to install, simply log in to our browser-based Chat Panel and start interacting with potential customers. Build your own fully customized chat buttons and adapt the chat window to fit the look and feel of your website. You decide how to approach your users: Enable proactive chat invitations, ask your users to rate your service and collect Facebook Likes & Tweets as a reward for your awesome chat service. Whether you are a one man show or a multinational with hundreds of service employees, we've got your back. Userlike is used by some of the world’s fastest growing companies. Userlike is easy to scale when your website traffic and support team increase. We understand that live chat is an additional channel for you and therefore needs to be integrated seamlessly into your setup of business software. We offer a wide range of CRM integrations and allow you to connect with our APIs for more elaborate integrations. Push your user information to Userlike for your operators to offer a personalized service, or pull chat transcripts and offline messages to your CRM.